Author: Richard Morton at Northumbria University (research carried out while at Sheffield University). The chromosphere is a region of the solar atmosphere sandwiched between the cool photosphere (6,000 Kelvin) and hot corona (>1 Million K). In contrast to the photosphere and corona, knowledge of chromospheric plasma properties is limited. However, modern satellites (Hinode) and ground-based imaging and spectroscopic instruments (ROSA/IBIS/CRISP) have allowed for detailed studies of the chromosphere, revealing that it is composed of fine-scale, magnetic structure. The chromosphere is believed to play a pivotal role in the heating of the solar atmosphere. Observations show that the fine structure displays highly dynamic behaviour, suggesting that the magnetic field supports magneto-hydrodynamic (MHD) waves which are considered important for energy transport. The nomenclature for the different kinds of fine structure is diverse; here we will focus on the dynamics of fibrils that exist in chromospheric regions associated with the quiet Sun, presenting observations that demonstrate the existence of both kink and sausage wave modes in the same fibril structure. Figure 1: The left hand panel shows a dispersion diagram for the magnetic cylinder, which plots dimensionless wave number, ka, against phase speed. Here, k is the wavenumber and a is the radius of the cylinder. Only the low order (m=0,1) wave modes are shown. The right panel displays the two fast MHD waves, namely the sausage mode (m=0) and the kink mode (m=1). The horizontal arrows show velocity vectors in the radial direction. The sausage mode causes a periodic contraction and expansion of the cylinders cross-section, symmetric about r=0. The kink mode displaces the central axis of the cylinder perpendicularly to the direction of the magnetic field (depicted by vertical arrows labelled B). It has been demonstrated that an inhomogeneous plasma with complex magnetic field geometries can support a plethora of MHD wave modes [1,2]. Solutions to the perturbed MHD equations for magnetically structured plasma can be displayed in a dispersion diagram (Figure 1). If we model the fine-scale magnetic structure as a cylinder, the order of the modes (m) refers to the symmetry of the wave motion with respect to the central axis of the cylinder (i.e., about r=0). In Figure 1, we show only the low order wave modes (m=0,1) for a plasma in which the gas pressure is much less than the magnetic pressure. The waves then fall into two distinct bands, namely the slow waves that propagate with speeds close to the sound speed (cs) and fast waves, which propagate with speeds greater than the Alfvén speed (vA). The expected motion of the magnetic cylinder due to different low order waves is shown schematically in Figure 1. The low order wave modes are now observed in the solar atmosphere fairly regularly (i.e., the slow waves and fast kink mode). Figure 2: The quiet chromosphere as seen in H alpha with ROSA. The dark features are the fibrils, which can be seen to dominate the field of view. 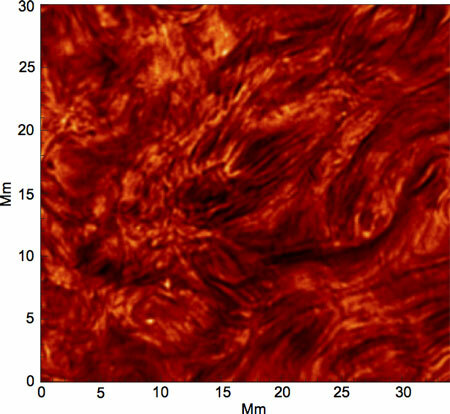 Figure 2 displays an H alpha image of the fibrillar structures that form the quiet chromosphere, observed with the ROSA imaging system (published in ). Recent modelling has confirmed that the dark fibrils are dense structures that follow the magnetic field . We are able to observe the motions of the fibrils by taking a cross-cut perpendicular to their central axis and stacking images over time to create a time-distance diagram. An example of this is shown in Figure 3. A relatively wide fibril is shown, and the time-distance diagram reveals there is a periodic, displacement of the fibrils central axis (red line). We identify this motion as that of the fast MHD kink (m=1) wave (Figure 1). The observed kink motion has a long wavelength (λ=2π/k), hence is located on the dispersion diagram in Figure 1 where ka is small. In this limit, the wave is highly incompressible, i.e., it does not perturb the pressure in the fibril. However, in addition to the kink motion we also identify a periodic change in the width of the fibril (yellow bars), found to be in anti-phase with a periodic change in the intensity of the fibril (Figure 3 – top right panel). The change in width and intensity suggest the wave mode is compressive, and we identify the change in width with the sausage wave mode (m=0 – see Figure 2). We were able to measure the propagation speeds of the wave modes, finding speeds in excess of 50 km/s, with sausage modes propagating faster than the concurrent kink modes. The typical sound speed in the chromosphere is around 10-15 km/s and both waves propagate with speeds much greater than this, hence we can identify them both as fast wave modes. The value of ka is also small for the observed sausage modes, meaning that they lie in the leaky regime (region above vAe that is not depicted in Figure 1). The fact the mode is classed as leaky has subtle implications for wave propagation. The wave phenomena are not rare and we have managed to find numerous examples of kink motion in the fibrils (, see also ) and also many examples of the fast propagating sausage mode . Figure 3: (a) A close up image of a two larges fibrils with the position of a cross-cut shown. (b) The time-distance diagram produced from the cross-cut. The red dashed line tracks the periodic displacement of the central axis of the structure (kink) and the yellow bars highlight the periodic variation in the width of the fibril (sausage). The neighbouring fibril can also be seen to display kink motion. (c) The periodic variation in width (red) and intensity (blue) of the fibril are plotted as a function of time. The error bars mark data points and a smoothed line through the points is also over plotted. The kink mode has been observed in various regions of the solar atmosphere, e.g., in the corona  and in chromospheric spicules . However, due to the properties of the fast sausage mode, its detection by imagers has remained elusive. The observations presented here demonstrate that the detection and measurement of such waves is possible. Further, the fact that we can observe both wave modes in individual magnetic structures is also novel and suggests that the plethora of predicted MHD wave modes are likely present. This is supported by observations that reveal both torsional Alfvén (also m=0) and kink waves in a spicule . Significantly, the bulk of the quiet Sun chromosphere appears to be composed of the fibrillar structure, so these results imply that the observed wave motion is likely ubiquitous throughout the chromosphere. The real importance of these observations is that they imply that the observed dynamic motion of the chromosphere is only possible if the waves are transporting a significant amount of energy. The energy estimates associated with these observations show that the combined wave energy flux in the chromosphere due to the sausage and kink modes alone is on the order of 10,000 W/m2. These estimates suggest that the observed waves are then able to provide a significant contribution to the heating budget of the quiet chromosphere and corona (~10,000 W/m2 and ~200 W/m2, respectively). However, improved estimates of wave energy flux are required, evidence for the dissipation of the wave energy is still lacking and the details of the mechanism(s) that excites the waves are unclear. The high quality data from ROSA (and other instruments) still has a lot to reveal about the dynamics of the chromosphere and dedicated large-scale studies of wave behaviour are the next step (e.g., ).